Our opening event will set the tone for a great conference by sharing the “Aloha Spirit”, which is unique and very special to Hawai‘i. Upon arrival, guests will be greeted with a traditional fresh flower lei by hula maidens and handsome young men. Our trio of musicians will be performing background Hawaiian melodies, along with other contemporary and easy listening sounds. Guests will sip delicious exotic libations and sample selections of the finest cuisine of the Pacific Rim, while enjoying our native Hawaiian artisans, who will be demonstrating their craft. The sound of the conch will signal the start of our exciting lu‘au, complete with Huli Huli Pig and the exotic flavors of native Hawaiian cuisine. 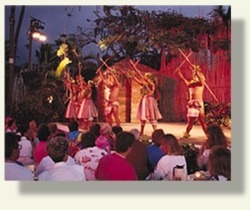 While guests enjoy the tastes of Hawai‘i, our Polynesian Show will take them on a journey through the Islands of Polynesia, as they feature authentic dances and music of Hawai‘i, Samoa, Fiji, New Zealand and Tahiti. When our evening comes to a close, our guests will stroll leisurely back to their rooms realizing that they have just experienced the beginnings of a memorable week with friends in Paradise.